This is the twenty-ninth in a series of blog posts by NBCC board members covering the finalists for the NBCC awards. The awards will be announced on March 6, 2008, at the New School. We ride such a cranked up tilt-a-whirl of entertainment and dread in 2008, it’s about time someone took a poetic stab at describing how strange it is to be alive. In “Modern Life,” her strange and wondrous new volume, a finalist for the National Book Critics Circle Award for poetry, Matthea Harvey has given it a fantasist’s go. Here is life in the terror age, full of gizmos and green house gases, as described by one of our fizziest, associatively agile young poets. Even when her poems fail they do so in a chunky hail shower of their own brilliance. in case we ever saw the sky again. In other words, these odd ballads of hopelessness make very little logical sense, but they stab at the rituals of fear and fantasy that define modern life. Live with them just a while and impossibly, feverishly, they become a linguistic ear worm. Walking down the street, weeks after you’ve put the book aside you’ll find yourself humming one of their hysterical tunes. 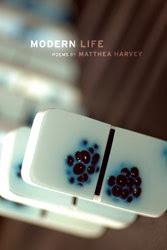 "NBCC Finalists for Poetry: Matthea Harvey’s Modern Life" was posted March 05, 2008.